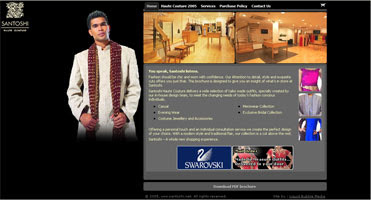 Is it me, or have most asian fashion boutiques completely missed the point when it comes to their company websites? That's if they even have websites in the first place!! I want to see beautiful outfits! I want to see different variations of colours, styles, embroidery, I want to see what's hot NOW, not your collection from 2 seasons ago! In my search for some inspiration, here are some sites I came across for good asian bridalwear pictures - click on the pic to go to the site...butbe warned, some of these sites haven't been updated in a VERY long time! 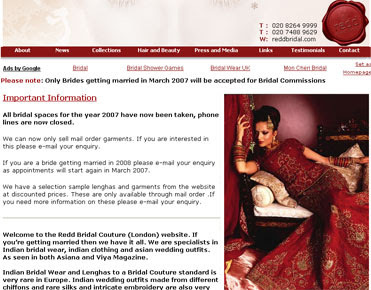 Redd Bridal - based in London, this company boasts that they "accept no more than 140 bridal outfit commissions per season". The Good Stuff: pictures, from traditional bridalwear to party outfits and couture. Oh yeh and the testimonials with pictures, of course outfits looks amazing on models, but the REAL test is how good they look on us mere mortals!! The Bad Stuff: The "news" sections hasn't been updated since 2005! From the way they describe themselves, these outfits are obviously really expensive - but that's just a guess, no prices on the site at all. Santoshi another one based in London (although they do have a stockist in Wolverhampton too). The Good Stuff: clear pictures, full details about each outfit, prices in different currencies. The Bad Stuff: 2005! Yep, all the designs, prices, updates, everything is from 2005!! It's a shame really, cause they have some fab stuff, if their online catalogue was up-to-date they'd probably get loads of orders. I always think that the websites are so rubbish cos they think that peole are just going to copy them anyway. But to not update your website since 2005!!!!!!!!! Thats is ridiculous, they might as well just close the website down. Has anyone got any other examples of good or bad websites?